Gorgonzola takes its name from a Lombardian village with the same name where it was first produced, but no Gorgonzola have been made there for the last 30 years. The “Si Invernizzi”dairy, which is located in Piemonte in the vicinity of Milan, is producing two types of gorgonzola, a piquant one and a soft, uncooked one. Whole cow’s milk from nearby farms is freighted daily to the dairy. where it is poured into large tanks before being pasteurized and cooled. Then, a certain quantity of milk is poured into a large, open container and heated to about 30°C before adding rennet, an enzymic compound extracted mainly from calves’ stomachs, together with selected milk enzymes and a selection of fine moulds. The latter ingredient give the cheese its characteristic blue-green veins and its unmistakable taste. When the curd is ready, that is when it has thickened to a certain degree, a worker uses a kind of grate with a handle, called a guitar, in order to cut up the curd into small pieces. Having finished this operation, the curd is transferred into a long, rectangular container already covered with a porous cloth covering the whole container. When the curd enters the tank, the liquid parts of the curd passes through the cloth and a diverse set of holes in the tank, while the fat parts are remaining. 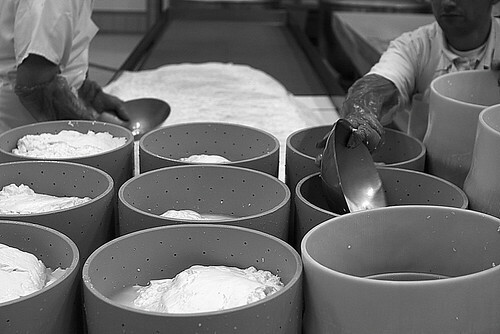 The remaining curd is collected manually by the workers and put into holed containers, permitting more of the liquid parts called the whey to be expelled. Then, lids are put on top of the containers, before turning them upside down a couple of times during the next 36-38 hours in order to get rid of more of the whey. Having finished the above mentioned phase, salt is applied in order to both give taste to the cheese and get rid of more of the whey. Then, the cheeses are brought into rooms with controlled humidity and temperature. Next, the cheeses are holed by means of a machine because the holes allow air to enter the cheeses such that the special mould, which was added to the curd, will grow and give the cheese its characteristic taste. Thereafter, the soft gorgonzola cheese stays maturing for 2 months, while the piquant one has to mature for 3 months. Finally, the cheeses are packaged using a characteristic aluminium foil embossed with the name of the dairy, identifying these cheeses as unique products. Production of the cheeses are partly done manually, that is the operations which are done best manually, like transferring the curd into containers, turning them upside down, cleaning the cheeses and packaging are done by hand. 80% of the finished cheeses are sold in Italy, while the rest is exported. You can copy and paste whatever you like to a file or files on your computer.